A couple of months ago, Jon from Flat Cat Gear sent me this Snow Leopard (Original) Cooking System to check out. Since then, I have used the stove a number of times, many of those here at home for a cup of tea, cocoa or even to try out some different backpacking meals. However, I also took this system out with me on a few day hikes and most recently on an overnight hike up to Mt LeConte in the Great Smoky Mountains National Park. 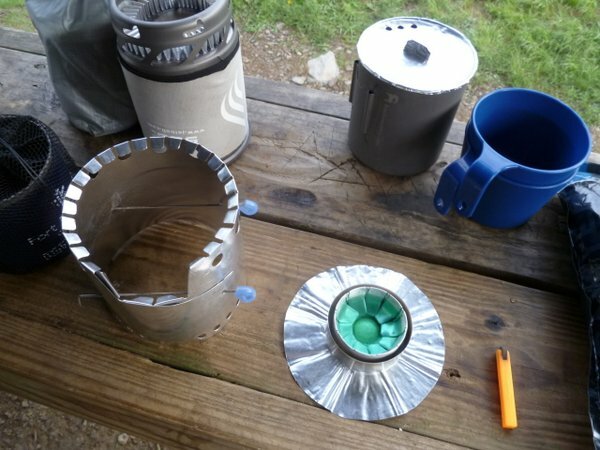 When I first received the Snow Leopard Cooking System, I had all intentions of using it with an IMUSA 800 ml cook pot, however, I quickly ended up changing over to my Backcountry.com 700 ml cook pot. 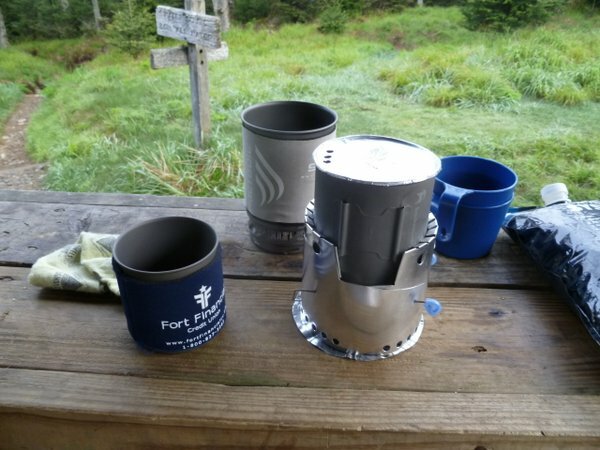 For some reason, I was experiencing some inconsistencies in boil times as well as burn out times when using the IMUSA cook pot, so after talking with Jon, he suggested me to give my Backcountry pot a try. After further thought on my part, I wonder if the particular IMUSA pot I was using was pushing the size limits for the “Original” Snow Leopard System (remember, the Snow Leopard System is offered in 3 sizes) and was also contributing to the inconsistencies. According to the chart on the Flat Cat Gear site, the Original Snow Leopard System will work with a cook pot 4 inches tall and 3.6 – 4.1 inches in diameter. This particular IMUSA cook pot is just a hair over 4 inches. On the other hand, my Backcountry pot has a diameter of only 3 & 5/8 inches. Notice the slight green coloring. This is from the residue left behind from the very beginning. However, since I stopped coloring the fuel, as well as started using the smaller diameter Backcountry cook pot, the times have been a bit more consistent. In a “controlled” environment, the boil times (when using 20 mls of fuel and 2 cups of water) are consistently between 8:30 and 8:50 with a burn out time of around 11:10. When using the system outside in a relatively calm environment (again, with 20 mls of fuel and 2 cups of tap water) I generally get a boil around 9:15 – 9:30 and a burn out time around 10 minutes. I would also like to add that Jon contacted me just recently and told me about a mod that he has started making to the Flat Cat stoves which would lead to reduced variability in the time to boil and increased fuel efficiency. He asked me about sending me a mod’ed stove out, or just simply giving me the info to make the mod myself. Seeing that I was heading out that very weekend, I requested Jon to simply send the info to do the mod myself. Jon quickly sent me the instructions (along with pictures) of how to do the mod myself. It was actually quite easy. I simply used my thumb to push the tabs inside the stove down into the corners. Before the mod, the tabs inside the stove were sloped downward, but after this mod, the tabs were now pressed against the side wall and followed the contour of the stove along the bottom floor. The mod’ed stove. Note the tabs inside the stove are bent rather than sloped. 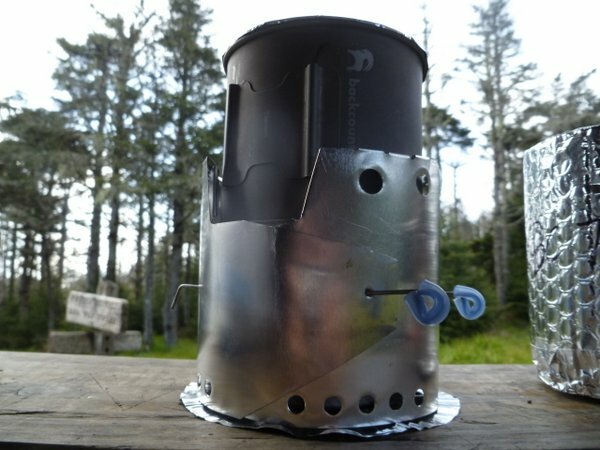 Since doing this mod I have only used the stove 3 times, which were on the trail. I like to do my homework before leaving out on the trail so that when I get ready to cook (by this I mean boil water) on the trail, I already know what I need to do. When getting ready to cook, I simply want to set the system up and get it going, and then go on with the other tasks (such as setting up/breaking down camp or preparing the food). So, because of my limited use after the mod, I cannot say from personal experience what kind of difference the mod has made concerning boil times or fuel efficiency. Also worth noting, about 80% of the time I have used this system, I have used HEET (in the yellow bottle) as my fuel, but recently I have picked up some S-L-X Denatured Alcohol to try out with some stoves. The few times that I timed a boil when using S-L-X in the stove, I did notice a slightly faster boil time than when using HEET, but I have not used it enough to know for sure how consistent it is. As well, when on the trail I generally prefer to boil more than 2 cups of water so that I can have a little extra water to clean up with afterwards. Because of this, I still carry and use 1 oz of fuel per meal. Also, when on the trail, I do not use a syringe or a measuring cup to measure the fuel out. Instead, I have 30 ml markings on my fuel bottle and I simply measure (eyeball) the fuel according to the markings when filling the stove on the trail. As far as set-up, now that I am used to handling the system, set-up is quite simple. I will admit, the first few times I set it up, I had to fidget with it a little to get the holes in the windscreen lined up correctly to get the pot support pins in the holes while making sure that the tabs at the top of the windscreen were layered correctly and in the right spot, but after assembling a few times it became much easier. Even so, I have found that tear down and storage of the system is just as easy. So, now it is time for me to send the Snow Leopard Cooking System back to Jon. I will say that I will miss this system for sure, but I will also admit that it will be ok because I really enjoy using one of my very own DIY cook system’s as well, which I have recently made some changes to! Disclaimer: Flat Cat Gear has loaned me (free of charge) this Snow Leopard Original Cooking System for reviewing purposes. I do not own this system. At this time I am now returning all of the items that Jon sent me for review. 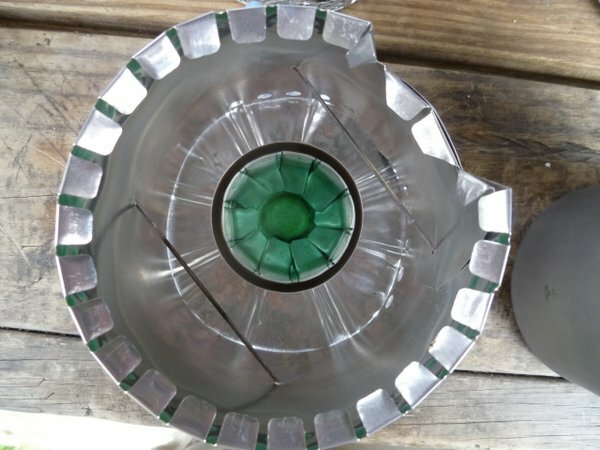 After talking with Jon about returning the items to him, he requested me to hang on to the hardware indefinitely due to the fact that he has changed up the design somewhat since sending mine. I happily accepted! In the future I would love to try out both the simmer ring that he has designed for the Flat Cat stove as well as one of the Iso-Clean stoves! So, I want to extend my thanks to Jon for both the opportunity to try this cook system out as well as for letting me hang on to the system. This entry was posted in Cook Kits, Gear Stores, Stoves and tagged Backcountry.com 700 ml Ti pot, Backpacking, Cooking Systems, DIY Cook System, Flat Cat Gear, Flat Cat Stove, Hiking, IMUSA Cook Pot, Snow Leopard Cooking System. Bookmark the permalink. As for my system, well i don’t particularly keep to one specific stove. I check out what the conditions will be and vary between gas and meths depending. The Trangia burner in the BPL pocket ti stove works well as does the white box. Gas wise especially in cold times i use the express spider from Primus. or the Coleman F1 lite. Thanks for checking it out and commenting! And I agree with you, I don’t always keep to one particular system either, although I will admit, I am always using alcohol though! As far as temps, using alcohol for me year round is no problem here in the southeast. I have used alcohol in temps down to the teens and it worked just fine. 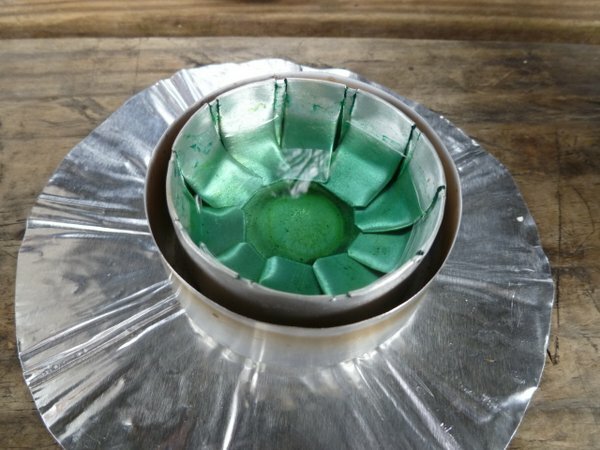 I do have a Jetboil Sol Ti but don’t care to use it, however, I think it is one of the better canister stoves on the market simply due to the regulator in the stove. The regulator will allow this stove to work much more efficiently in lower temps than most of the other canister stoves which do not feature regulators. However, I actually keep the Sol around to use as a loaner stove for others. I would really like to get the Soto OD-1R Micro Regulator stove to use for myself in case I ever want to use a canister stove though.